I haven’t shared one zucchini recipe with you this year. That is kind of ridiculous considering it’s a staple at our house starting mid-summer. We still have zucchini growing like crazy and, unlike many others, we are STILL loving it. For those of you who are looking for another creative and delicious way to use zucchini I must share one of my new favorite ways to use to use it. 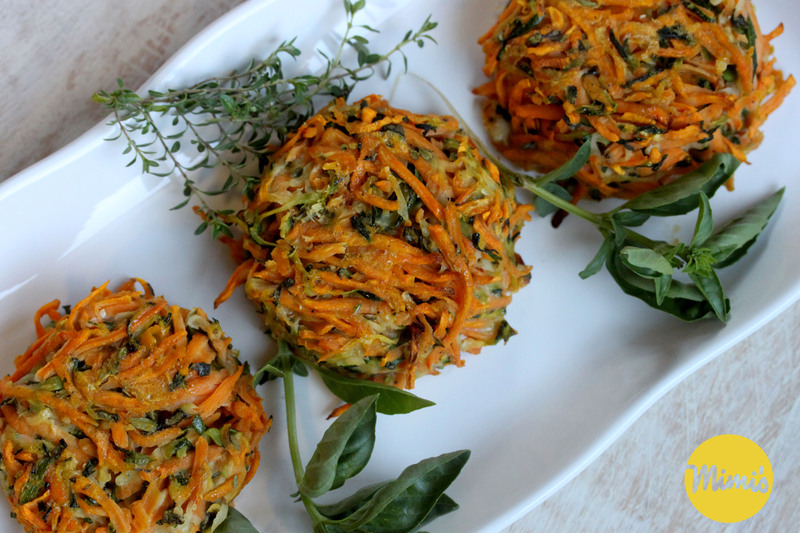 These fritters make such a delicious side dish and go with just about any main course. And, they look pretty fancy to boot! They are seriously easy to prepare, especially if you have a food processor. I like using the food processor to shred my sweet potatoes and zucchini for two reasons. 1 – It’s fast. 2 – Everything turns out to be the same size. However, if you don’t have a food processor you can totally use a hand grater and your fritters will turn out just fine. Also, if you’re a bit salt-sensitive, then I recommend rinsing your zucchini after the 30 minutes. This will take some of the salt off the zucchini. I slightly rinsed mine and then just used a wooden spoon to gently squeeze the zucchini against the colander to remove any excess water. You’ll find that I used a combination of fresh Thyme and fresh Basil. You can really use just about any combination of fresh herbs you desire. I found these to be delicious and well-balanced and . . . I happened to grow them in my little herb garden this year. The herbs really help elevate the freshness of these fritters. Soooo yummy! Most fritters are typically fried, however that’s not really a great option when looking for healthy ways to prepare foods. So, I went with a baked option and we loved the way these turned out. You seriously should add these to your zucchini recipe files. These fritters are a keeper and we totally love them at our house. Plus, having one more way to mix up the zucchini is a huge bonus when we practically eat it every day. Place shredded zucchini in a colander (place colander over a bowl to eventually collect liquid from zucchini) and sprinkle salt over zucchini. Gently toss the zucchini and salt. Let zucchini sit for approximately 30 minutes. This will remove excess liquid from zucchini. Gently push zucchini with a wooden spoon against sides of colander to squeeze any additional liquid from zucchini. Remove zucchini from colander and place in a medium-large sized mixing bowl. Add the shredded sweet potato to zucchini and set aside. Meanwhile, preheat oven to 375 degrees and line a baking tray with Silpat, parchment paper, or aluminum foil and spray with cooking spray; set aside. In a medium microwave-safe bowl, melt the butter (about 1 minute on 50% power). To the melted butter add the egg and egg white and beat with a fork to combine. Add the black pepper, the flour and herbs to the butter/egg mixture and stir to combine. Pour this mixture over the sweet potato and zucchini and toss to combine. The mixture will be loose and a bit soggy. Using a 1/2-cup measure, form fritters by transferring one packed half-cup of vegetable mixture from mixing bowl directly to baking tray. Bake fritters for 10 minutes at 375 degrees. You’ll find that the fritters will “leak” additional liquid (either from the zucchini releasing additional water or from the butter/egg mixture) and this is okay. Lower the oven temperature to 350 degrees and bake for 15 minutes. Carefully flip fritters over (they will be soft and delicate, so be careful not to break them) and bake for 15-20 more minutes, or until browned. Fritters will be browned and soft upon removal from the oven. Serve hot/warm. Your delicious recipe has been nominated as one of the “Top 100 Best Potato Fritters Recipes on the Internet”. You can view it and vote for it here: http://potato-recipes.org/best-potato-recipes/best-potato-fritters-recipes-internet/ (position #34).